I’m partnering with Silk® to bring you today’s recipe! I’m a huge fan of their products, especially their non-dairy milks. With many lactose-intolerant family members, Silk’s products are always a staple in my fridge! Earlier this year, just after New Year’s Day, my mom resolved to lose a few pounds. With all of the holiday cookies and candy completely eliminated from the kitchen, she felt like her goal was actually achievable—especially with us cheering her on! Instead of turning to a fad diet for a quick fix, Mom focused on making small changes in her daily life. She started tracking her daily steps, always with the goal of exceeding 10,000, and she often squeezed in a brisk walk during her lunch break on non-rainy days to help reach that total. She even chose spots at the far end of the parking lot to fit in more steps while running errands! Mom also incorporated new habits into her diet. She added a handful of fresh berries to her daily breakfasts, and at lunchtime, she walked across the street to the grocery store to pick up her favorite kale salad… Instead of crossing the street in the other direction for pizza and gourmet ice cream! Yet the one part of her daily routine she has been hesitant to change is her chai latte. She drinks one every morning! 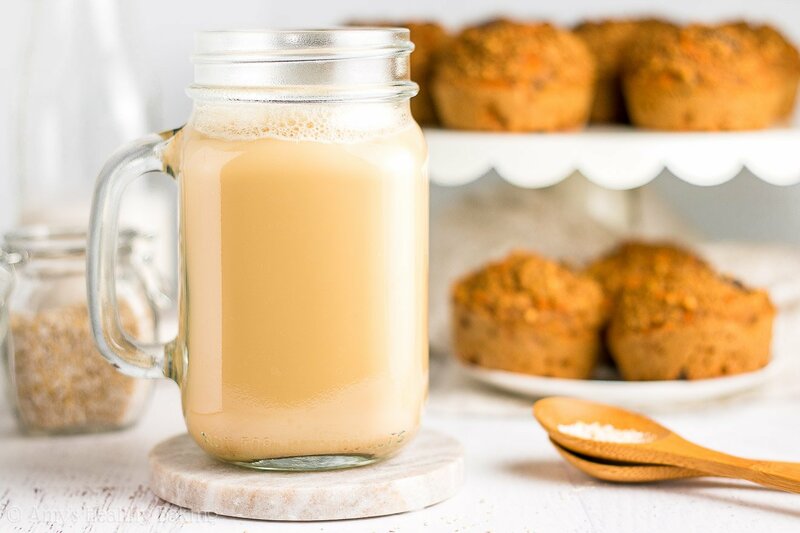 She stopped buying them from the coffee shop on her drive into work, but she still uses a powdered mix to make them at home… Which contains nearly 2 tablespoons of refined sugar in each glass. Yikes! 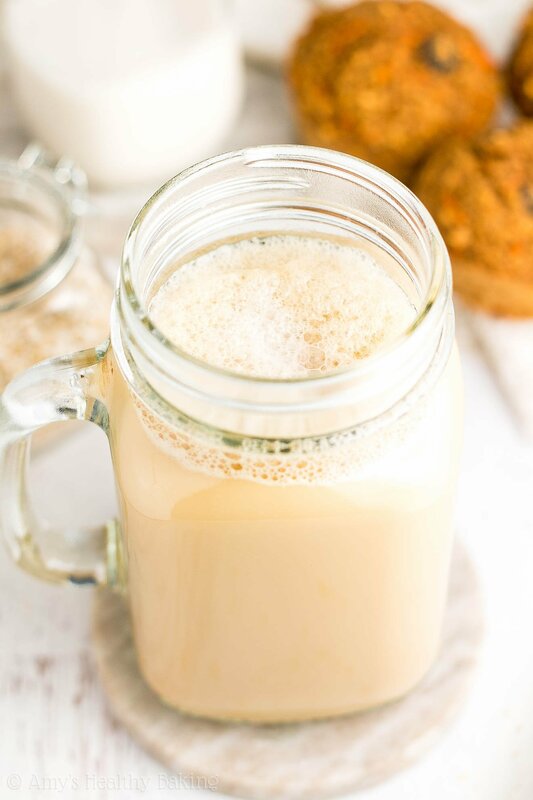 So when I recently flew home to visit my parents, I whipped up this Super Easy Chai Latte for her! It’s thick and creamy, thanks to Silk’s unsweetened vanilla almondmilk that Mom and I both love, which also means this easy homemade chai latte contains no added sugar or artificial ingredients—and just 30 calories! Super simple, super cozy, super delicious… What’s not to love?? 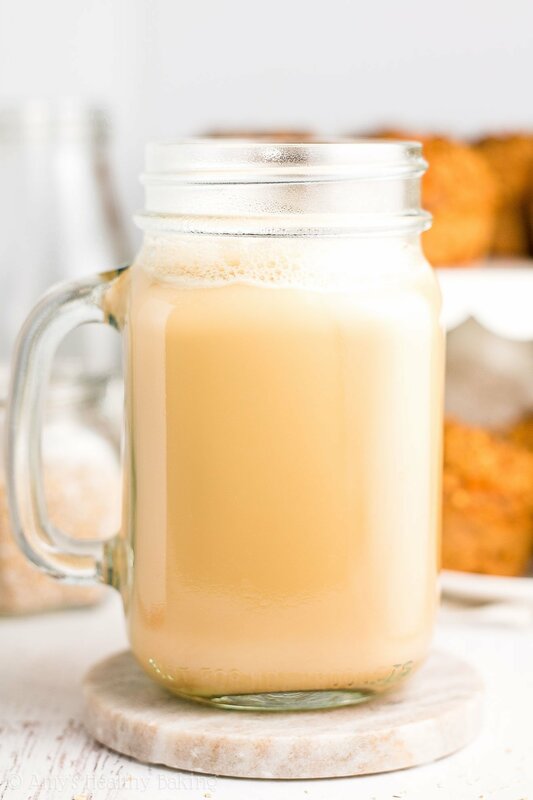 Let’s quickly go over how to make your easy homemade chai latte! It starts with chai bags (like these!). Chai = black tea + lots of spices. Usually, those spices include ginger, cinnamon, cardamom, and cloves. Some companies include more spices in their chai bags, but regardless… They always taste so cozy and comforting! You’ll boil water (I do that in the microwave—much faster!) and steep your chai bags for at least 5 minutes. I usually let them sit for closer to 10 minutes because Mom and I both love strong spice flavor! 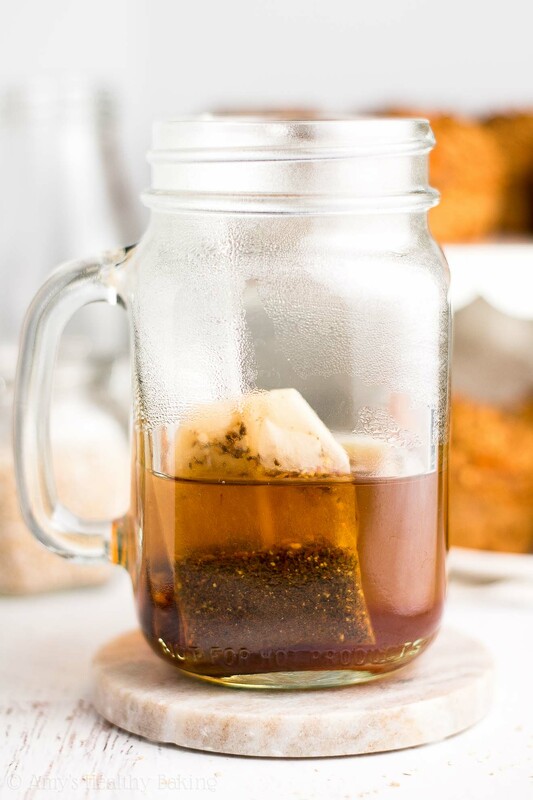 Once your chai has steeped long enough to suit your tastes, then heat a cup of Silk’s unsweetened vanilla almondmilk. Not quite to boiling—we don’t want any burned tongues! Again, I do this in the microwave because it takes less than half the time of doing it on the stove. And enjoy! Psst… When you make your own, remember to snap a picture and share it on Instagram using #amyshealthybaking and tagging @amyshealthybaking IN the photo itself! (That guarantees I’ll see your picture! ?) I’d love to see your chai latte! 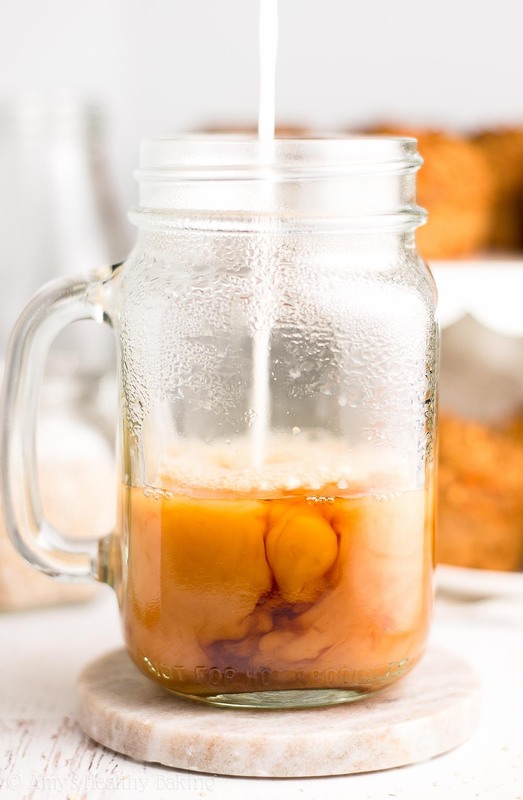 I love starting my mornings with this homemade chai latte! It’s smooth and creamy with plenty of cozy spice flavor… And I love how I can control the sweetness level, unlike ones made at coffee shops! This recipe is easily doubled to serve more! Microwave the water for 1 minute 30 seconds (1:30), or until boiling. Add the 2 chai bags. Let the tea steep for 5-10 minutes (5 minutes for regular strength, 10 minutes for strong chai flavor). Microwave the almondmilk for 1 minute 15 seconds (1:15), or until hot but not boiling. Remove the chai bags from the water, and pour in the hot almondmilk. Stir in your preferred sweetener, if using. Notes: These are the chai bags that I use! I also love using Silk unsweetened cashewmilk to make my chai latte! It’s a bit thicker and creamier than the almondmilk. 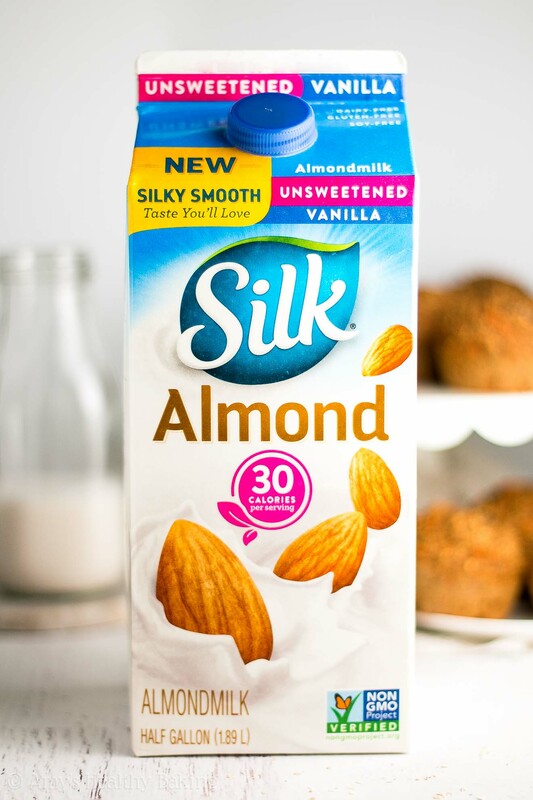 To be honest, any of Silk’s non-dairy milks work really well in this recipe—and I love them all! I love using my favorite vanilla stevia as the sweetener, while my mom prefers a sprinkling of coconut sugar. Feel free to use your favorite sweetener! 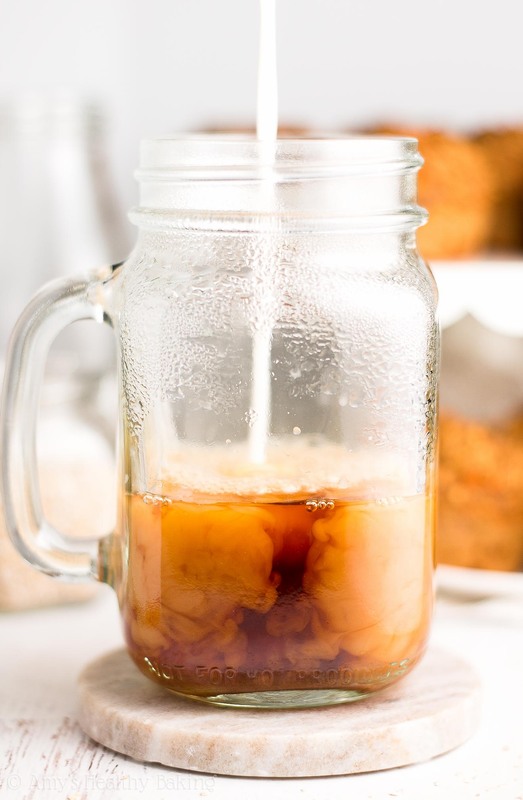 You can easily make this chai latte on the stove instead of the microwave! I find that the microwave heats up liquids much faster… And that means you get to enjoy your latte that much sooner! This post was sponsored by Silk. As always, all text, photographs, opinions, and recipe are my own. You can find Silk’s products near you by using their store locator here, and you can sign up for their email newsletter here to receive free coupons! Hi,good morning oh your super chai latte looks so good and tasty.i am going to copy down your chai latte tea and then I am going to make your tea asap after I buy the silk almond or cashew milk.i have the loose chai tea that I can put in a tea bag and let it steep in my thermas container that stays hot for up to 8 hours that I just bought from David’s tea store in Edmonton.I use our k cup machine to put the hot water in a measuring cup put my loose leaf chai leaves in a bag and put it in the hot water and let it steep for a short 10 minutes and then I add two packets of stevia powder,almond milk,cashew milk or natrel milk in my new David’s tea thermas and then I can go do whatever I want to do throughout my day like go for my long walks,go to the malls in my city,go to the Steele heights Baptist Church etc before I go home,and by the time I get home my thermas is empty. That sounds like such a wonderful thermos to have, Kim! So handy that it keeps your tea hot for that long! 🙂 I can’t wait to hear what you think of this chai latte! I had a chai latte this morning from a cafe around the corner and they made it with a tea bag and no syrup – so much better this way in my opinion! Much less expensive to make this at home though! Great minds must think alike! 😉 I’d love to hear what you think if you decide to try this homemade version! I swear we must be on the same wavelength…I made one of these just this morning, and nearly identical to how you prepared it! 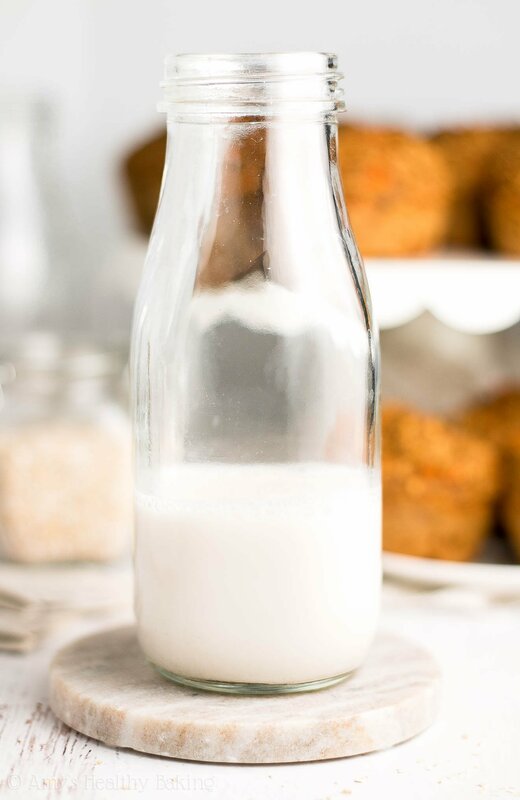 A bit of a story…last week on my grocery run, I stopped by the specialty health section, saw the cashew milk, and thought, “Hey, Amy gushes so often about cashew milk…I’d better give it a try.” And it’s just as fabulous as you say! Creamy, thick, and even naturally sweet. Since I gave up coffee for Lent, tea is my fix these days, so I wanted to treat myself to a little chai latte with my newfound super ingredient. What a funny coincidence! Great minds, as they say. Happy Passover/Easter! ?? YAY!! I’m so glad you enjoyed the cashew milk Celina! I’m honored that you’d consider purchasing it based on my opinion — that means a lot to me! 🙂 And yes, great minds definitely think alike! 😉 Happy Easter weekend! Great recipe. Love Chai Latte. I personally don’t like to microwave the water. Microwaves are great for so many things, but I drink a lot of tea and I swear that the brew tastes different than if you boil the water normally. I have an electric teapot that heats the water really fast. Just a personal preference. Hi,would pumpkin chai tea be ok to use in your chai tea latte?I will buy a box of twinnings chai tea soon.I am also going to buy a carton or two of silk cashew milk and the almond milk and then i can make your tea latte.